What is the EU’s foreign policy quality in terms of ‘actorness’ and ‘power’ compared to other types of actors in international relations and global politics? 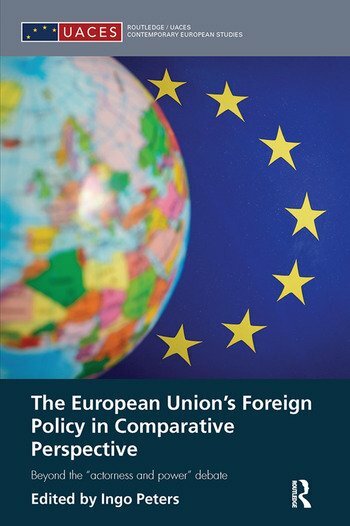 What factors influence the EU’s foreign policy performance in comparison to states and international organizations? This guiding principle and application of a ‘grounded theory’ or ‘heuristic case study’ approach allows the book to deliver a structured comparative analysis of EU foreign policy, comparing findings across policy fields, different legal foundations and respective policy modes of governance. This book will be of key interest to students and scholars of European Union studies, European Union foreign policy studies, international relations, and security policy studies. Ingo Peters is Associate Professor of Political Science at the Freie Universität Berlin and Executive Director of the Center for Transnational Relations, Foreign and Security Policy, Germany.